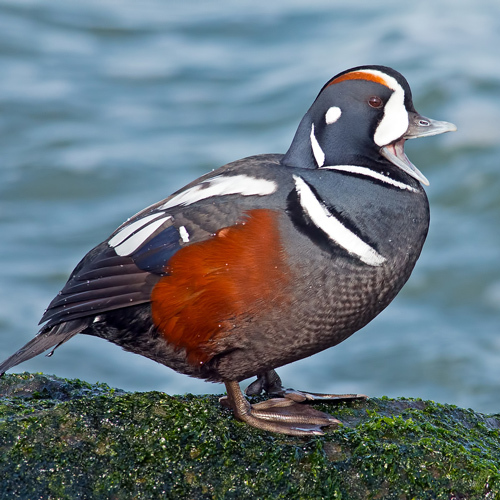 There are eight main species of duck that are native to Alaska; The Harlequin being the most recognized, due to the males’ vibrant and colorful appearance. The Harlequin species is known to migrate from North America and eastern Asia. 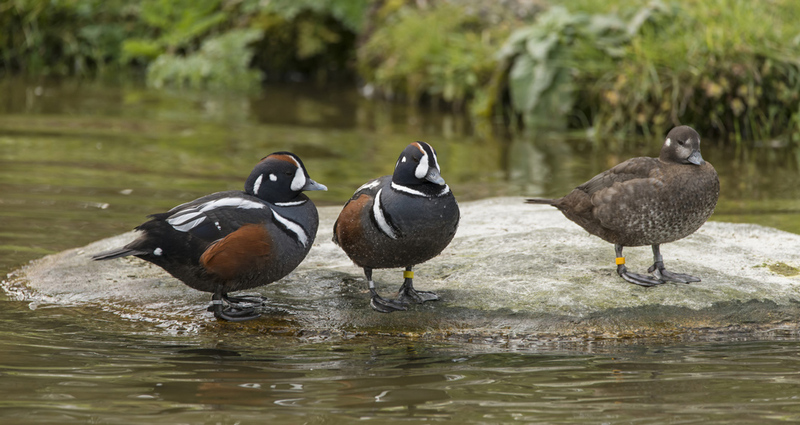 Large concentrations of these Alaskan ducks are found primarily in the Gulf of Alaska. Unfortunately, their lives have been increasingly impacted by the Exxon Valdez Oil Spill (EVOS), an influx of recreational boating, and machinery, making their rescue crucial for their survival. Within Alaska, there are three main species of geese; The Canadian, being the most well-known, the Emperor, and the Greater White-fronted. The Canadian goose is highly recognized across the state for its’ prominent black head and white cheek “patch”. These Alaskan geese typically follow a migration route from the Gulf of Alaska, down to California. This particular species has had close-calls to extinction, in the past, due to hunters, fox, and other predators. Since these threats have not depleted by much, their rescue will ensure that their existence will not be endangered, once more. 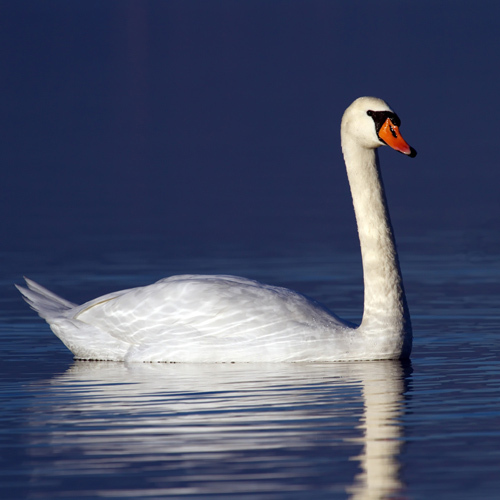 The two species of swan that are native to Alaska are the Trumpeter and Tundra swans. These Alaskan birds can be located, mainly, in temperate forests and are almost always near a body of water. They are known to migrate near the Columbian River, located in Washington and also to Vancouver Island, located in Canada. Although these species are no longer endangered, they are still highly threatened by excessive amounts of hunters, and recreational activities, which can ultimately disrupt their nesting, making their rescue paramount. What do I do if I find a baby duck, baby goose or baby swan? 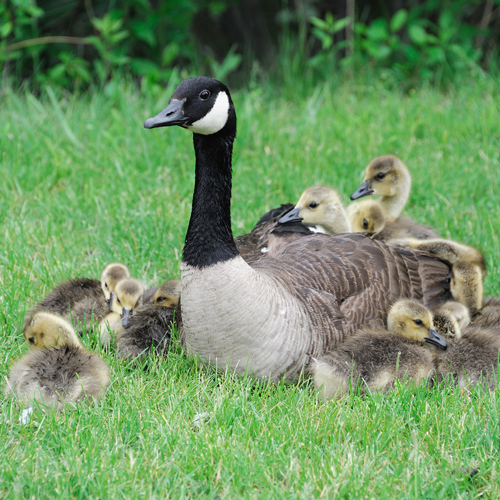 It is common for ducklings, baby geese, and baby swans to become separated from the rest of their brood or group. It is important to note that if you are to come across one, try to locate a pond or other body of water nearby, where the rest of the brood may be. If they are found, release it as close to its’ mother as possible. Furthermore, if you come across a duckling, baby goose or baby swan on a road, safely park your car, watch for other vehicles, and attempt to shepherd the baby across the road, and again, try to locate the rest of the brood or the nearest body of water. However, if it is suspected that the parent or group is nowhere near by, please contact Alaska Wildlife Rescue for further assistance. Is there any nests near the bird? Is the young bird having problems swimming? Is the bird near a road or open water? Can a picture be taken of the bird safely? Are there any feral cats or dogs nearby? Have you seen any adults nearby? What do I do if I find an injured duck, goose or swan? In many cases, people will find duck, geese, and swans at their nesting grounds, where the bird will normally stay in the same place for several hours at a time. This behavior is perfectly normal, but can easily be misconstrued as the bird being sick or injured. Additionally, it is also important to note that these Alaskan birds can be dangerous if approached because they are trying to protect their nests. However, if you do notice an obvious injury, please contact Alaska Wildlife Rescue, immediately. It is essential to remember that the least amount of contact is best to prevent any further injury. Is the bird in the open or in a confined area? Is there any obvious injury to wings or is bird leaning over?